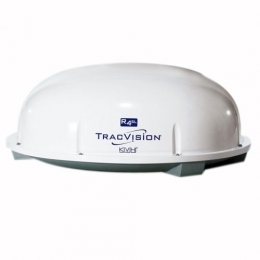 Equip your Caravan or Motorhome with the TracVision R4SL. Ensure you get the finest programming, its by far the easiest stationary automatic HDTV solution available, so you can enjoy the HDTV programming you love from the farthest reaches of europe, great if you take your caravan or motorhome to the south of spain Norway or even Iceland. The TracVision R4SL includes a high-gain antenna and reception far superior to competing antennas, so youâll be enjoying TV when other Motorhome owners have lost the signal. Plus, itâs easy to use â you never have to leave your seat if you want to watch programming on another satellite â just change the channel with the remote control. Enjoy the best that satellite TV has to offer, anytime, anywhere, and on the move.